My students and I love sharing our favorite holiday stories, and this week we read a new Hanukkah story that's sure to become a favorite. I especially enjoyed our discussion afterward -- this story is rich with feeling and meaning, perfect for reading together. Young Simon is bound for America, with just his rucksack, a bit of food his mother packed, and a lot of determination--like many who have left their homes in search of work and opportunity. He's lucky, getting the last ticket on a ship leaving for America. Simon "managed to get the very last ticket for a ship bound for America." 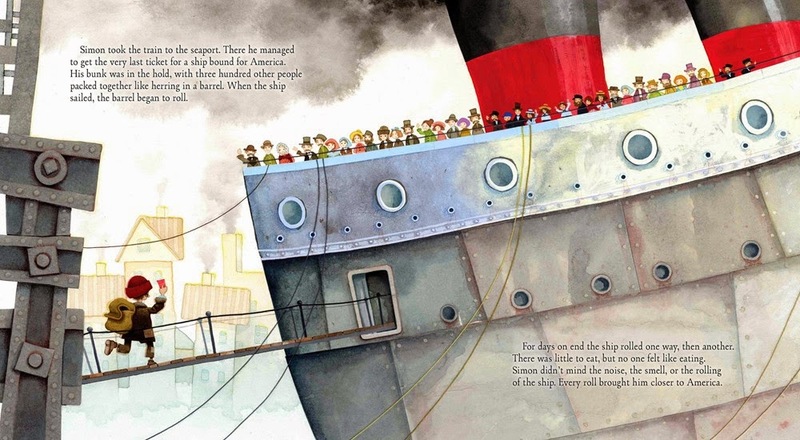 But Simon's luck ends quickly when his ship strikes an iceberg--ooh, just like the Titanic, many of my students said. After generously giving up his place in a lifeboat, Simon leaps onto the iceberg. When a giant polar bear approaches, Simon shares his food and makes a new friend. 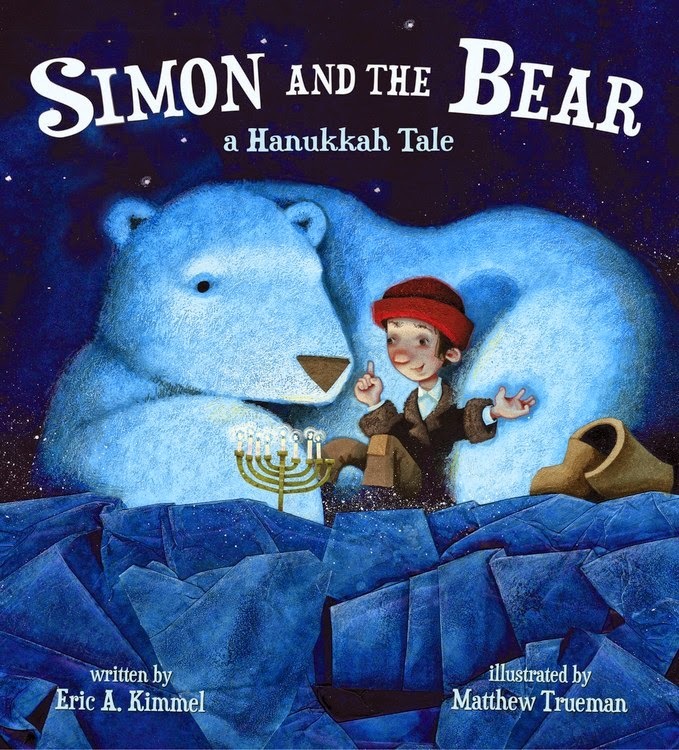 Is it a Hanukkah miracle that brings a friendly polar bear to Simon, or is it his caring, generous nature? "He crept over to the bear and snuggled against her fur." My students loved the way Eric Kimmel crafts this story. They shared many ideas about how Simon found the strength to endure this hardship. All of them noticed his courage, but they also noticed Simon's empathy, thinking about the man to whom he gave his place on the lifeboat. We talked about how Simon thought about what the polar bear might want, sharing his food with the bear--at school, we talk about this as listening with our ears, eyes and heart. 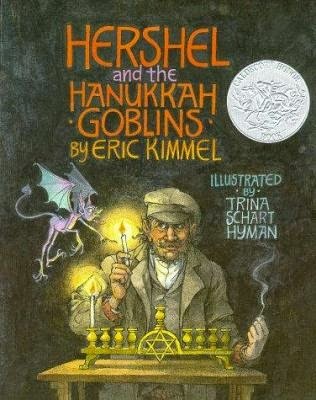 Eric Kimmel is one of my favorite authors--it would be fascinating to compare Simon to Hershel from Hershel and the Hanukkah Goblins, a classic holiday story I love to read with students. Is Hershel brave and compassionate in the same way as Simon? 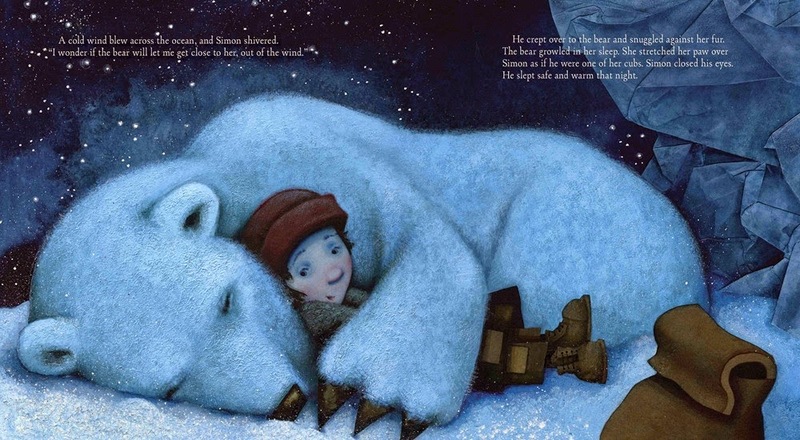 If you like peering into how authors come up with their stories, check out Eric Kimmel's blog post he wrote just as he submitted Simon and the Bear to his editor. The review copy was kindly sent by the publishers, Disney-Hyperion. All illustrations are copyright ©Matthew Trueman, 2014, and shared with permission of the publisher. If you make a purchase using the Amazon links on this site, a small portion goes to Great Kid Books. Thank you for your support.